I´m using 1Password 6 since a few weeks. Works fine so far. Before, i used 1Password 4 on my Win10 PC. 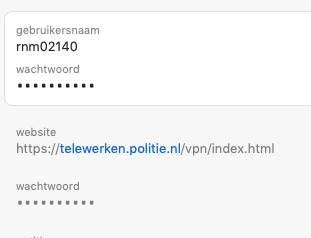 I have one login for my company wich uses a username and two passwords. the second password is a token code. The first four digits of this token code are always the same. In 1Password 4 this works fine, so that the username, the first password and the first four digits of the second password was filled in automtically by 1Password. Since 1Password 6 this doesn´t work anymore. How to create this loging. Hey @stormracing! I'm assuming that the extra token doesn't fill at all here (let me know if I'm wrong), so could you check the login item in 1Password 6 and let me know if the token code shows when you click Show web form details in the item details? If not, try having the 1Password extension recreate the item. Move the item to trash (you can still copy/paste passwords from items in the trash), sign in again and allow the extension to tell 1Password to create the new login, edit it to remove the digits that change from the token code field and let me know if the recreated item fills properly. I'm wondering if the importer may not have imported the form details properly. Thanks! The Token Code is stored in the item and i can see it. Recreating the login doesn´t work. I tried this multiple times. 1 PW is storing this wrong, so that the Token Code is filled in in the line for the first Password. I edited this now so, that the real Password is filled in in the corret line. The Token line is now free and i have to fill in the first four digits of the Token Code manually. It works. However not so fine as in 1PW 4, but it works. Are you aware of what software/brand/tool is powering the login page, so we can try to find it and investigate how it works, to improve our filling algorithms? It´s NetScaler with Unified Gatway. Thanks for that URL, we can confirm the issue. They're randomizing the field names each time you refresh the page, so what's saved in the web form details isn't going to match at all. That's why the second field (which is designated as the password) is filled into the first password field. 1Password 4 has the same issue as 1Password 6, we use the same 1Password extension for both 1Password program versions. Our algorithm isn't tuned for two separate randomized password fields but we'll investigate for a different way to approach this. I have the Same Problem with double passwords. Is there maybe a solution in 1Password 7? It's hard to say without some more detail, @eddimello. This thread was about an issue very specific to a certain website that was doing, for lack of a better term, weird stuff. Are you having this issue with a particular site or more universally? Are both of these passwords part of your Login item(s) or are you seeing a separate Password item for this site? I don't believe there is much we could have done or can do to address randomly generated field names, but that doesn't mean there's no solution to your problem as I suspect it's likely quite different. @bundtkate your right it's about a netscaler gateway site from Citrix. Asking for a username, pincode and password like the screenshot. Thank you for the additional info! It seems that your situation is quite different. For starters, you are using 1Password for Mac, not 1Password 4 for Windows, which this discussion is about. As for the issue at hand, please try to follow the steps in this guide to save a Login manually in your browser. Let me know if it works for you. No worries, @eddimello! Especially when you're coming from a Google search, it's not always super obvious which category you're in. I think you can be forgive. Regardless, did Greg's suggestion work for you? That's the universal first step to try, regardless of OS, so should hopefully help on Mac as well. @eddimello: I am glad to hear that it worked! Please do not hesitate to contact us in the future. And yes, you can post your messages in any thread, we are here to help.